One of my university friends is behind the idea for this – I went to visit her in London, after university had finished and real life had begun, and she fed me with food far beyond the dishes we had cooked as students. Dessert was a very simple but very elegant fruit tart – essentially fruit on top of puff pastry, served with lashings of cream. I have developed this idea a little bit, on the basis that plums and almonds work so well together. The flaked almonds add a pleasing crunch to the texture of the tart, in addition to the lovely combination of flavours. Preheat the oven to 220C/200C Fan/Gas Mark 7. Line a large baking sheet with baking paper, and once the pastry has been out of the fridge for 10-15 minutes, unroll it and place it on the sheet. Sprinkle the ground almonds evenly across the pastry. Halve all the plums, remove the stones, then chop each half into four. 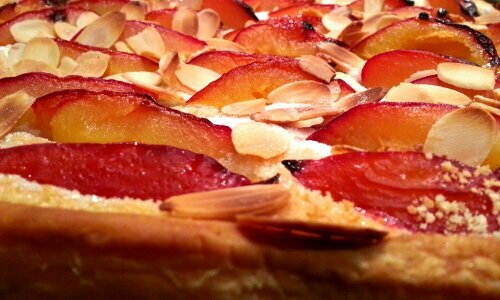 Arrange the plum slices on the pastry sheet, as snugly as you need to, to fit them all on. Sprinkle the flaked almonds on top, then the caster sugar. Bake for 20 minutes, then leave to stand for 10 minutes. Sprinkle with a little more caster sugar and serve with cream or ice cream. 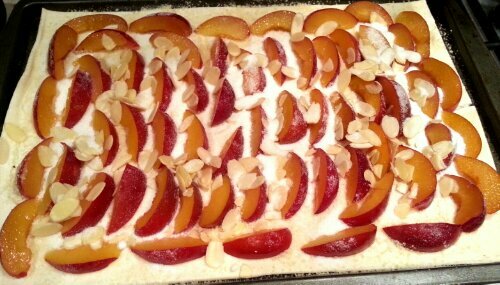 Mr F put this particular tart together, all I did was cut up the plums, so the credit goes to him today. Freelancer in the UK who spends a lot of spare time in the kitchen and, more recently, the craft room. I like cooking things from scratch, I love baking, and I'm learning to crochet.